Objective To test the hypothesis that the use of an automated external defibrillator by police and fire fighters results in higher discharge rates for out of hospital cardiac arrest. Design Controlled clinical trial with initial random allocation of automated external defibrillators to first responders in four of the eight participating regions; each region switched from control to experimental, and vice versa, every four months. Setting Amsterdam and surroundings, the Netherlands. Participants Patients with witnessed out of hospital cardiac arrests, identified by the emergency medical system between January 2000 and January 2002. Main outcomes measures Survival to hospital discharge; return of spontaneous circulation; admission to hospital. Results 243 patients (65% in ventricular fibrillation) were included in the experimental area and 226 patients (67% in ventricular fibrillation) in the control area. The median time interval between collapse and first shock was 668 seconds in the experimental area and 769 seconds in the control area (P < 0.001). 44 (18%) patients in the experimental area versus 33 (15%) patients in the control area were discharged (odds ratio 1.3 (95% confidence interval 0.8 to 2.2), P = 0.33), 139 (57%) experimental versus 108 (48%) control patients had return of spontaneous circulation (1.5 (1.0 to 2.2), P = 0.05), and 103 (42%) experimental versus 74 (33%) control patients were admitted (1.5 (1.1 to 1.6), P = 0.02). The median delay from receipt of call to dispatch of the ambulance was 120 seconds, and the delay to dispatch of the first responder was 180 seconds. Conclusions Use of automated external defibrillators by first responders did not significantly increase survival to discharge from hospital, although it did improve return of spontaneous circulation and admission to hospital. Improved dispatch procedures should increase the success of programmes of first responders using external defibrillators. Automated external defibrillators (AEDs) are computerised devices that are reliable and simple to operate, enabling trained lay rescuers to perform defibrillation as a key element in resuscitation effort.1–4 Initial uncontrolled reports showed that police officers used the AED skilfully and successfully.5 6 Two recent studies of dispatched police suggested improved survival from out of hospital cardiac arrest.7 8 The 2000 guidelines for cardiopulmonary resuscitation and emergency cardiovascular care consider use of the AED to be a class IIa recommendation for level one responders such as police and fire fighters if the emergency medical system cannot achieve a first shock within five minutes of the call.4 A class IIa recommendation indicates that the weight of evidence or opinion is in favour of usefulness, efficacy, or both. No prospective randomised controlled clinical trial has been done to test the benefit of the use of AEDs by dispatched first responders. We did a controlled clinical trial with systematic allocation of AEDs. This allowed us to test the hypothesis that introduction of AEDs used by dispatched first responders in a standard emergency medical system will result in higher discharge rates for out of hospital cardiac arrest. We designed the study as an open clinical trial, with controlled allocation of AEDs. We included patients with witnessed cardiac arrest in whom resuscitation was attempted. We excluded patients below the age of 18 years, patients with a cardiac arrest of traumatic origin, and patients whose cardiac arrest was witnessed by the emergency medical system. The study area included the city of Amsterdam and a surrounding area with urban and rural parts, including 1.6 million inhabitants and covering 885 km2. We achieved randomisation by systematic allocation of AEDs. We divided the study area into two regions with the fire brigade as first responders and six districts with police as first responders. The experimental area consisted of one fire brigade region and three police districts, equipped with 50 AEDs (LIFEPAK 500 AED, Medtronic Physio-Control, Redmond, WA, USA). The other fire brigade region and police districts served as the control area. Every four months we collected all the AEDs from the experimental area and distributed them in the control area, which then served as the experimental area for the next four months. With this procedure we tried to ensure an even distribution of external characteristics such as population, socioeconomic status, hospitals, response times, and seasons between the two groups. In total, each region served 12 months as the experimental area and 12 months as the control area. When the emergency medical system dispatch centre suspected a cardiac arrest, it dispatched two ambulances and then immediately alerted the police or fire brigade dispatch centre. All ambulances were manned by a nurse or paramedic and a driver, equipped with a manual defibrillator and qualified to perform advanced cardiopulmonary life support. After receiving the call from the dispatch centre, the police or fire dispatch centre directed a police patrol car or fire engine to the scene. Immediately thereafter one of our dedicated data collectors (a team of trained fifth year medical students working in shifts covering 24 hours a day) travelled to the scene independently from the emergency medical system or first responders. Neither the firemen nor the police officers had ever responded to medical emergencies before, but they were trained in cardiopulmonary resuscitation. All fire and police districts were adjacent without geographical overlap. Police were dispatched in both experimental and control periods, and the fire brigade was dispatched during experimental periods only. When first responders reached the scene of the arrest first, in an area serving as experimental area, they would perform cardiopulmonary resuscitation and use the AED. When the ambulance personnel arrived at the scene they would take over the resuscitation and use their manual device. When the ambulance personnel arrived first at the scene, they started the resuscitation and first responders assisted in cardiopulmonary resuscitation if necessary. The protocol for delivery of shocks was 200 J, followed by 200 J, and then 360 J for each shock thereafter as needed for defibrillation. For the study, 1063 police officers and 586 fire fighters were trained in the use of the AED, and their cardiopulmonary resuscitation skills were refreshed. Officers were trained in pairs in 3.5 hour sessions. Refresher training was conducted at eight months intervals. Data collectors collected the data at the scene. They collected data on the circumstances of the cardiac arrest, the estimated moment of the collapse, witnesses, cardiopulmonary resuscitation by bystanders, sequence of events, and relevant time points by using a standardised method to directly interview all people involved. They downloaded the electrocardiogram and voice recordings from the AED and the electrocardiogram of the manual defibrillator. They corrected deviations of internal clocks by comparison with radio controlled wristwatches. Time of call, dispatching, and arrival on scene of first responders and ambulance were obtained from time corrected dispatch computers. Date of death or discharge was obtained from hospital records. The primary endpoint of the study was survival to hospital discharge. Secondary endpoints were return of spontaneous circulation and admission to hospital. We analysed all endpoints on an intention to treat basis, irrespective of whether first responders or ambulance personnel performed defibrillation. The study was powered to show an absolute difference in survival between the two groups of 12% (from 8% to 20%), assuming a decrease in the median time interval from collapse to defibrillation from 11 minutes to six minutes. We assumed that ventricular fibrillation would be the initial rhythm in 60% of patients and that the probability of survival was 33% when the first shock was given in six minutes after collapse or 13% when the first shock was given after 11 minutes. Survival rate in any other rhythm was expected to be 1.8%. We expected cardiopulmonary resuscitation by a bystander to occur in 30-50% of patients. We based all assumptions on previous observations.9 With α= 0.05 and = 0.05, we needed 210 patients per group. Time intervals are expressed as medians and interquartile ranges. We tested significance with χ2 statistics for proportions and the Mann-Whitney U test for continuous variables. We accepted significance when a two sided P value was < 0.05 or confidence intervals did not include unity. We used logistic regression models to analyse the three binary endpoints. In order to match the analyses to the design of the study, we extended the logistic regression models with the generalised estimating equations method.10 11 This approach uses weighted combinations of observations to extrapolate the appropriate amount of information from correlated data,12 and allowed us to take into account any correlation that might arise from factors related to region or period. We used the generalised linear model procedure (proc genmod) in SAS version 8.2 to do this. We used SPSS 10.0 for Apple Macintosh for all other analyses. Between 5 January 2000 and 5 January 2002 905 patients had a suspected cardiac arrest. In 214 patients cardiac arrest was not present at arrival of help, and in 108 patients no resuscitation was attempted. Of the patients in whom resuscitation was attempted, 114 were not witnessed. A total of 469 patients met the criteria for inclusion: 243 patients in the experimental area and 226 patients in the control area. Table 1 shows the characteristics of these two groups. None of the differences was statistically significant, except the time interval between collapse and first shock (P < 0.001). Figure 1 and table 2 show the results for the primary and secondary endpoints, comparing experimental and control groups. The observed difference in survival could indicate that in a community where first responders are equipped with AEDs, 33 dispatches for a witnessed arrest could result in the added survival to discharge of one patient (number needed to treat). For four patients in the experimental group and three patients in the control group, the first responders witnessed or encountered the arrest without being dispatched. In the experimental group, three of these four patients survived to discharge. In the control group none of the three patients survived. 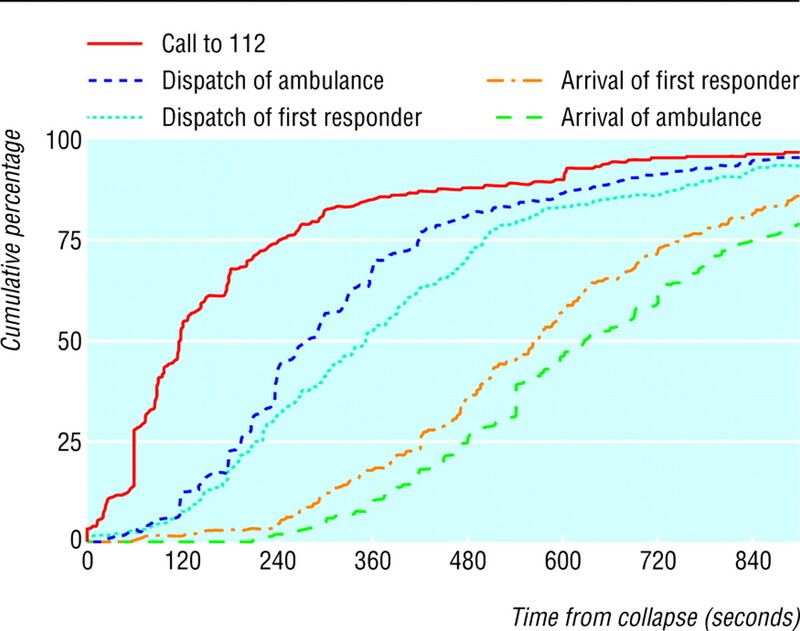 Figure 2 shows the cumulative time intervals for the process of call, dispatch, and arrival of the ambulance and first responders. 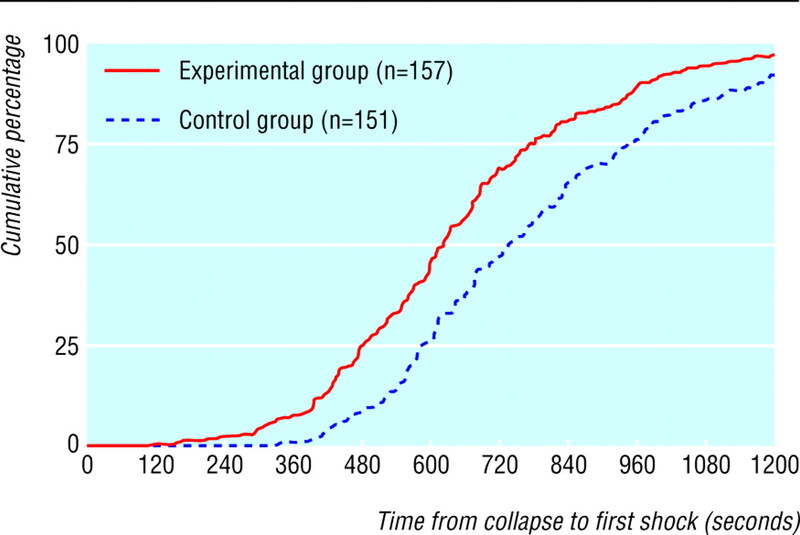 Figure 3 shows the cumulative time intervals between collapse and first shock for the experimental and control groups. The median time gain to first shock was 1 minute and 41 seconds in favour of the experimental group (P < 0.001). In the experimental group, 72 (46%) patients with a shockable rhythm were initially shocked by first responders and 85 (54%) patients by the ambulance personnel. In the control group, all patients received their shocks from the ambulance personnel. The median time it took the first responder, after arrival at the scene, to deliver the first shock was 136 (interquartile range 83-183) seconds compared with 143 (94-215) seconds when the ambulance personnel delivered the first shock in the control group (P = 0.07). The first shock was delivered in less than five minutes after call in 14 (9%) patients in the experimental group and in 2 (1%) patients in the control area (P < 0.001). Overall, 7/16 (44%) patients who received the first shock within five minutes after call survived to discharge. The first responders used the AED in 116 patients with a cardiac arrest. In 75 (65%) patients the initial rhythm was shockable; the AED recognised this rhythm and advised a shock in 72 patients (sensitivity 96%). In patients with an initial non-shockable rhythm, the AED never advised a shock (specificity 100%). When first responders used the AED, median time to transfer to care by the emergency medical system was 2 minutes and 52 seconds. The proportion of deaths in hospital was similar in the experimental and control groups, suggesting that a larger study would have given a significant result in the primary endpoint. A controlled study powered for the observed survival difference would need 2400-4000 patients in each group. Such a study will be increasingly difficult to do as public access defibrillation becomes widely available throughout the Western world,17 18 as the control group would then be contaminated by the off-protocol use of AEDs. According to the 2000 guidelines for cardiopulmonary resuscitation and emergency cardiovascular care, delivery of the first shock within five minutes of receipt of a call to the emergency medical system is a high priority goal.4 In the experimental group, 9% of cases met this criterion versus 1% in the control group. In the experimental group, 20% would have had a shock delivered within five minutes of the call if first responders had been dispatched simultaneously with the ambulance. We achieved unbiased allocation of treatment by the systematic allocation of AEDs instead of randomisation by patient. The allocation of AEDs changed from control to experimental area every four months, and we presumed that the allocation of treatment was independent of the characteristics of the patients, thus closely meeting the objectives of true randomisation. With the statistical analysis method we used we tried to account for unmeasured factors related to region and period. We included only patients with witnessed arrest, because only then could the time of collapse be estimated accurately. Non-witnessed arrest has a very low probability of survival, so the survival as presented overestimates the survival of out of hospital cardiac arrest in general. As the experimental treatment, use of the AED by first responders, could not be blinded, a potential bias existed in decision making and treatment of patients by the ambulance personnel. Not all arrests that occurred during the study period could be included in this study. On the basis of previous data, we estimate that about half of the arrests in the study region were not recognised as such by the dispatcher or the patient was not yet in arrest at the time of the call. Use of AEDs by first responders did not significantly increase survival to hospital discharge but did significantly improve return to spontaneous circulation and admission to hospital. Much of the potential benefit of dispatched first responders using AEDs was limited by time lost in decision making, incorrect decisions in the emergency medical dispatch centre, and delays in communication between dispatch centres. A dispatched first responder AED programme can achieve optimal benefit only when much attention is devoted to reducing time elements in the first link of the chain of survival, up to the arrival of first responders at the patient's side. The steering committee is: R W Koster, Academic Medical Center, Amsterdam, Netherlands (chairman); L L Bossaert, University of Antwerp, Belgium; D Chamberlain, Hove, UK; A F Cohen, Center of Human Drug Research, Leiden, Netherlands; M Eisenberg, University of Washington, Seattle, WA, USA; R A Niskanen, Medtronic Physio-Control, Redmond, WA, USA (non-voting member). The data safety and monitoring committee is: J G P Tijssen, Academic Medical Center, Amsterdam (chairman); R de Vos, Academic Medical Center, Amsterdam; H J G M Crijns, University of Maastricht, Netherlands; J Herlitz, Göteborg University, Sweden. We thank the participants in the dispatch centres for their efforts and cooperation, the police officers of the police district Kennemerland and Zaanstreek-Waterland, the fire fighters of the fire brigades of Amsterdam and Amstelveen, and the paramedics of the participating emergency medical system for their dedication. We also thank the medical students and C M Visscher-van der Burg for their work in data collection, I Vrenken-Witte for technical support, and J B Reitsma for statistical support.
. Sensitivity, accuracy, and safety of an automatic external defibrillator. Lancet 1984; 2: 318–20.
. Automatic external defibrillators: clinical issues for cardiology. Circulation 1986; 73: 381–5.
. Automated external defibrillators. N Engl J Med 2001; 344: 771–3.
. Part 4: the automated external defibrillator: key link in the chain of survival. Resuscitation 2000; 46: 73–91.
. High discharge survival rate after outof-hospital ventricular fibrillation with rapid defibrillation by police and paramedics. Ann Emerg Med 1996; 28: 480–5.
. Use of automated external defibrillators by police officers for treatment of out-of-hospital cardiac arrest. Ann Emerg Med 1998; 32: 200–7.
. Impact of community-wide police car deployment of automated external defibrillators on survival from out-of-hospital cardiac arrest. Circulation 2002; 106: 1058–64.
. Tripling survival from sudden cardiac arrest via early defibrillation without traditional education in cardiopulmonary resuscitation. Circulation 2002; 106: 1065–70.
. Out-of-hospital cardiac arrests in Amsterdam and its surrounding areas: results from the Amsterdam resuscitation study (ARREST) in ‘Utstein’ style. Resuscitation 1998; 38: 157–67.
. Analysis of longitudinal data. Oxford: Oxford University Press, 1994.
. Statistical analysis of correlated data using generalized estimation equations: an orientation. Am J Epidemiol 2003; 157: 364–75.
. Prevention of deterioration of ventricular fibrillation by basic life support during out-of-hospital cardiac arrest. Resuscitation 2002; 54: 31–6.
. Estimating effectiveness of cardiac arrest interventions: a logistic regression survival model. Circulation 1997; 96: 3308–13.
. Survival models for out-of-hospital cardiopulmonary resuscitation from the perspectives of the bystander, the first responder, and the paramedic. Resuscitation 2001; 51: 113–22.
. Influence of cardiopulmonary resuscitation prior to defibrillation in patients with out-of-hospital ventricular fibrillation. JAMA 1999; 281: 1182–8.
. Public-access defibrillation. Prehosp Emerg Care 1999; 3: 298–302.
. Defibrillators in public places: the introduction of a national scheme for public access defibrillation in England. Resuscitation 2002; 52: 13–21.
. Identification of cardiac arrest by emergency dispatchers. Am J Emerg Med 1986; 4: 299–301.
. The use of AEDs by police officers in the City of London: automated external defibrillators. Resuscitation 2001; 50: 141–6.
. Limited response to cardiac arrest by police equipped with automated external defibrillators: lack of survival benefit in suburban and rural Indiana-the police as responder automated defibrillation evaluation (PARADE). Acad Emerg Med 2001; 8: 324–30.